“I’ve never seen a waterfall.” Twenty-year-old Manon casually mentions while we wait in the queue. “What? Never?” I question in astonishment. “Well Belgium isn’t exactly known for its waterfalls, is It.” she defends with a laugh. “A fair point.” I concede, picturing Belgium’s flat terrain in my mind. I need a moment to process this. I was born in Scotland in a landscape where water flows off even the smallest of hills as spring melts the mountain snow, and roaring waterfalls are a typical feature of highland burns and rivers. I’d never considered life without waterfalls. 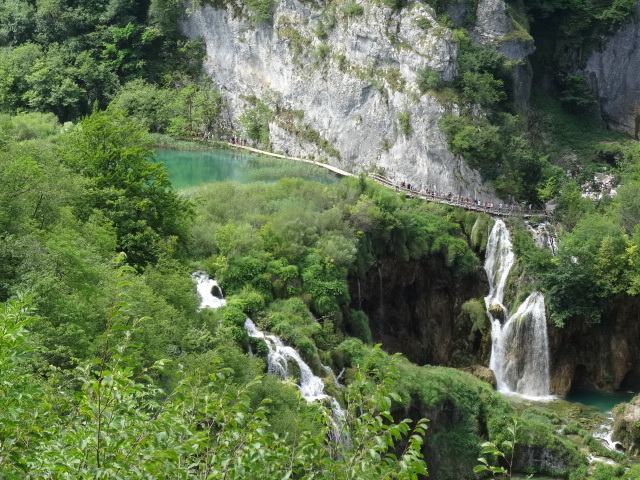 We are queuing to enter Plitvice Lakes National Park. 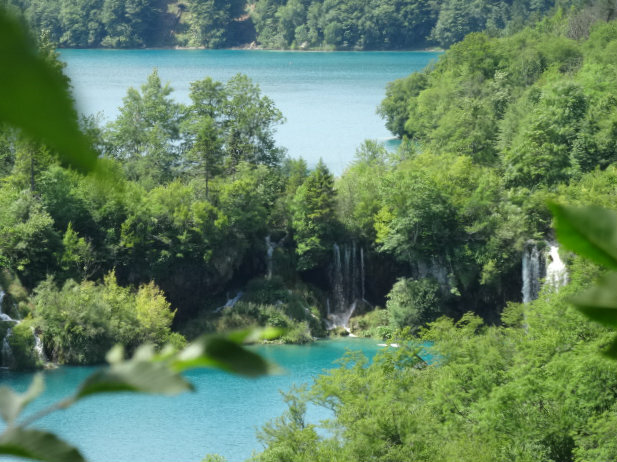 (Plitvička jezera). 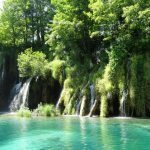 It is Croatia’s number one natural attraction, a UNESCO heritage site with sixteen terraced lakes connected by a series of waterfalls. I suspect this could be Manon’s lucky day. 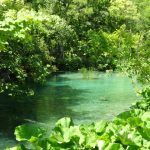 Walking up a short path we catch a glimpse of beautiful turquoise water through the leafy trees. 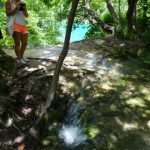 We stop to take a closer look and Manon sees her very first waterfall. Her eyes are as wide as her grin as she takes in its powerful beauty. “I never imagined it would be so noisy.” She exclaims. 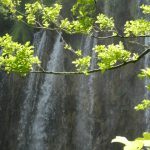 I look at the waterfall and try to visualize it through Manon’s eyes, touched to be sharing this special moment with her. 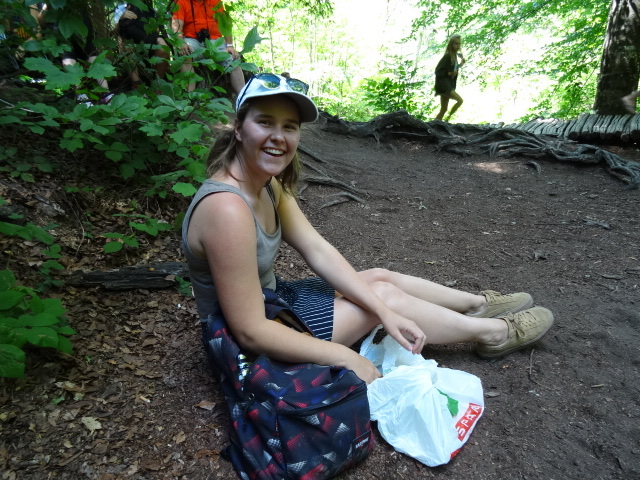 Manon is a lovely girl with a dry sense of humor who is on her first solo backpacking trip. 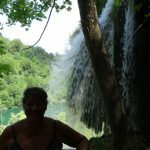 We met this morning on the minibus that took us here from Zadar. 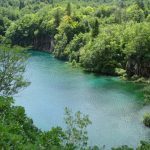 We have an easy six hours to walk the 8km length of the lakes before our minibus returns to Zadar and decide to spend the day exploring together. 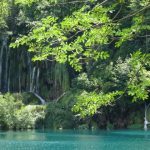 We take the little tourist train to the Upper Lakes, an ascent of around 900metres, that meanders through the lush parkland forest, glimpsing turquoise through dense foliage as we go. Manon has done her homework and tells me the park is home to a huge range of flora and fauna including deer, bears, wolves, boars and a large number of rare birds and butterflies. At the top, we get out and follow the signs to the footpath. 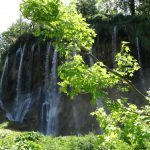 There is a total drop of around 135m between the lakes, and we take the snaking path down past waterfalls and along lakesides, stopping every few meters to view yet another breathtaking scene, trying to capture its full beauty with our cameras. 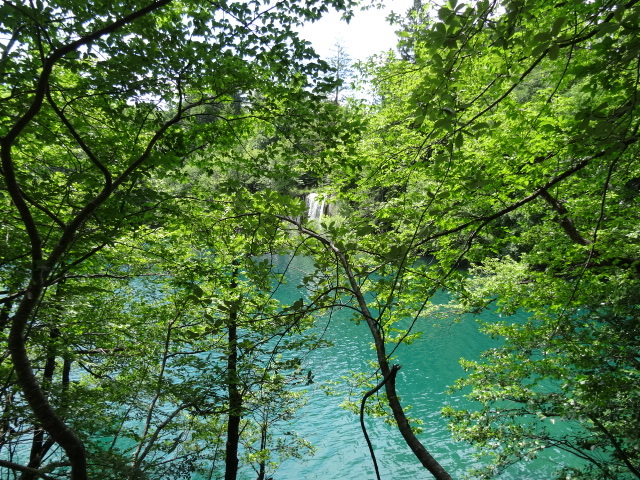 Rich in minerals, the turquoise color of the lakes is intense against the green foliage of the forest. 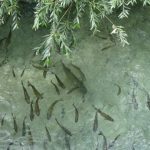 By the shores and under wooden walkways, shoals of fish swim in crystal clear water. 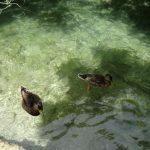 Ducks and other waterfowl skim across the lakes’ smooth surfaces, and butterflies and dragonflies dance and flutter amongst the grass and reeds. 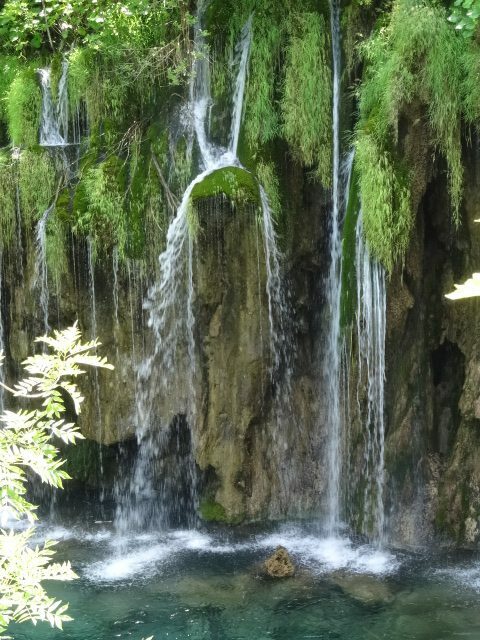 Waterfalls cascade noisily between each lake, curtains of water finding every crack and crevice on an endless journey to the next level. .We stop for a brief picnic lunch and then take the ferry to the Lower Lakes. We must have been taking too long to capture each scene and suddenly become aware that time is marching on. 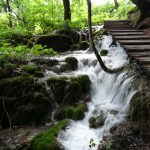 We need to pick up our pace if we want to catch the minibus back to Zadar, so we quickly zig zag along the footpaths now, only stopping at some of the waterfalls, indiscriminately choosing which ones to photograph. 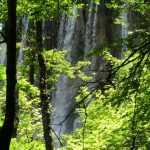 Finally, we make it to Veliki Slap, which cascades a splendid 70metres and is Croatia’s tallest waterfall, the grand finale of the day. It has been a truly wonderful day and my only regret is that I don’t have more time here. 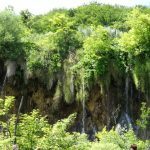 It is a walker and nature lovers paradise and I am sure it would be well worth spending a few days exploring the full extent of the Plitvice National Park. However, I am grateful to have spent what little time I have had in such cheerful and pleasant company. As we wait for the minibus to depart, Manon, the waterfall virgin of this morning makes a confession. To make her point she flicks through her photos, commentating as she goes. 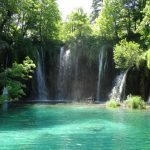 Plitvice Lakes National Park is definitely a must see place when visiting Croatia. 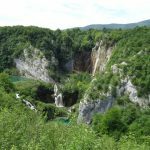 It can be extremely busy in the height of summer, as when we were there, so it might be better to visit in spring or late summer, but it would be incredible to visit anytime. 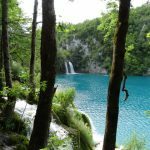 Situated about halfway between Zagreb and Zadar near the Bosnia and Herzegovina border the National Park can be easily accessed by public transport or tour operator from Zagreb, Zadar and Split to name a few. 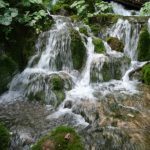 Viator.com is a Trip Advisor company that specializes in handpicked tours and local activities from around the globe, ranging from budget to luxury experiences. 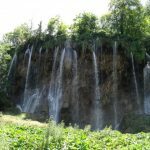 Click on the link to find their full range of tours and excursions to Plitvice Lakes National Park from all over Croatia. Barehotelier contains affiliate links. If you make a purchase through these links, I may earn a commission at no extra cost to you, which will gratefully go towards the upkeep of this site. What a lovely article – beautifully written and wonderful photos! 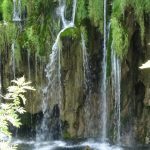 I loved seeing waterfalls anew through Manon’s eyes – and ears! Yes, they are noisy, aren’t they? It’s amazing – I had never heard of this place before! Another one for the bucket list! Well done, Ann! Thank you Sue. I am glad you enjoyed the post. 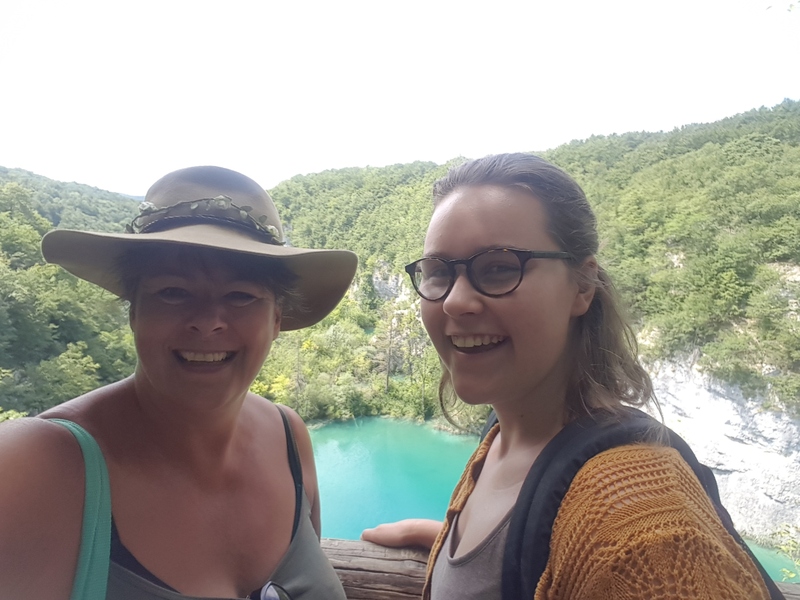 Yes, Plitvice is truly an amazing place and seeing it with Manon made it especially enjoyable. I hope you get to visit soon.